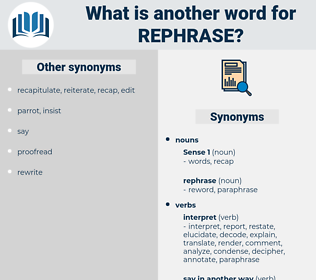 What is another word for rephrase? restate, rewrite, reorganise, redesign, revamp, amend. reformulate, reshape, reword, revise, reorganize, recast, redraft, restructure. echo, copy, reproduce, quote, transcribe, repeat. 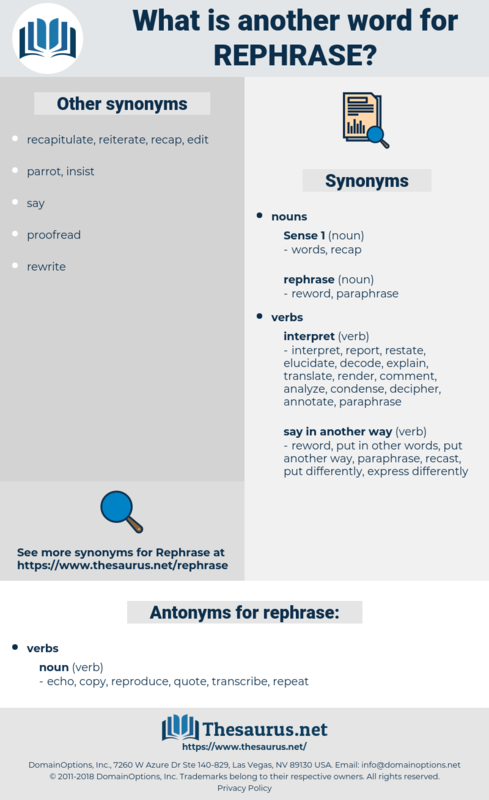 repercuss, rerebrace, reproach, repurchase, reprize, refresh, reovirus, River Kasai, reprise, rubberize, ropebark, roof rack, rubberise, rubric, reprocess, reverse, row of bricks, reappraise, repress, river horse, revers, reforge.